AbraxSys' high bright, sunlight readable LCD monitors and high brightness daylight viewable touch screen computers are ideal for use in any high ambient light condition, delivering the intensity, brilliance and long product life cycle your application requires. AbraxSys enhanced high bright TFT active matrix displays have brightness levels from 700 nits to 2200 nits; these direct sun daytime readable LCDs and touch screen computers significantly outperform commercially available non-enhanced products that washout in sunlight conditions. AbraxSys sunlight readable systems are ideal for most commercial needs, KIOSK, industrial, security, marine, military and vehicular applications. While a monitor with under 500 nits and a low 2 to 1 contrast ratio are visible in high light environments, the image quality of these displays are extremely degraded. AbraxSys' sunlight readable LCD monitors deliver a significantly higher brightness levels, achieving unparalleled image quality. AbraxSys' sunlight viewable displays are ideal for operation in any high ambient light environment, and delivers the brilliance and intensity required by your particular application. A high bright display is defined as an LCD with 700 nits or higher brightness and having a contrast ratio higher than 5 to 1. In high ambient conditions under shade, such a minimum definition sunlight display may provide a high image quality, but if used in direct sun may require higher nits and/or passive enhancements. For a better understanding of our brightness technology visit our High Bright Monitor Technology page. AbraxSys' high bright daylight viewable model LCDs have at least a 200:1 dimming ratio, allowing for the luminance to be adjustable from 100% down to 0.5%. Dimming capabilities are important to decreasing the backlight luminance resulting in increased backlight life. Additionally it decreases the power draw and decreasing the heat avoiding the thermal issues such as going isotropic. AbraxSys offers a comprehensive range of specially enhanced sunlight readable LCD monitors; these TFT flat panel LCD monitors are designed to operate in high ambient light conditions. Integrated with not only high-luminance solid-state, long-life LED backlighting, but also incorporates other advanced innovative technologies which helps boost efficiency of the backlight's light utilization and minimizes the surface reflection of ambient light. This unique combination of both active and transmissive enhancements produces brighter optical images, higher contrast and a wider range of vivid colors, even in bright outdoor light. 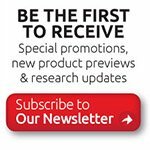 This advanced product line ranges from small format open frame LCD modules, to RETMA rack mount configurations, to panel mount models for reliable usage throughout NEMA 4 and 4X (Ingress Protection IP65 IP66) environments, to fully enclosed VESA mount LCD displays. These rugged Sunlight Readable high bright flatpanels are engineered in such a way so as to ensure maximum protection under harsh environments and throughout a multitude of real world applications. These daylight readable flat panel LCD monitors are available in various sizes (6.4", 8.4", 9", 10.4", 12.1", 15", 17", 19", 20.1", 21.3", 23.1", 24", 32", and 40"). 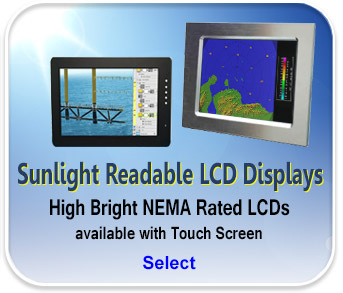 Each size Daylight Readable Industrial Grade LCD and/or Touch Screen Computer are offered in various mounting options; Bench Top, NEMA 4 (IP65) Panel Mount, NEMA 4X (IP66) Panel Mount, Rack Mount, and VESA Mount. Most models can be or already are configured with various touchscreen technologies including resistive, CP resistive, capacitive, projected capacitive (PCAP), or even a hardened armored touch technology. 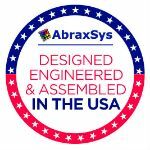 Unlike many "industrial" LCD flat panel manufacturers, AbraxSys never uses "repackaged" commercial grade modules, but rather only the highest grade components and true industrial quality LCD displays. This assures our customers with a top quality product, with reliable environmental safeguards, the highest video image characteristics and long lasting product life cycles. 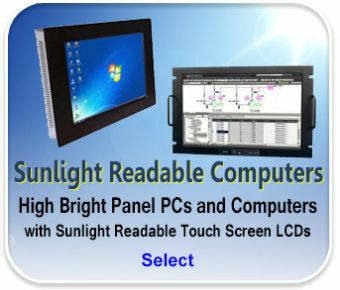 These superior quality daylight viewable highbright touch screen computers and Sunlight Readable LCD Monitors are an ideal solution for vehicle, KIOSK, large mining machinery, oil drilling, factory automation, marine/mobile and process control applications.